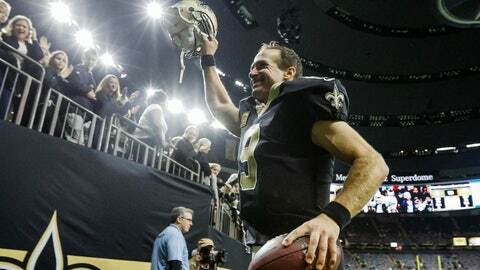 NEW ORLEANS (AP) — Drew Brees delivered accurate, aggressive throws downfield in tense moments, when conventional wisdom might have called for a more conservative play. New Orleans’ defense came up with a fourth-down stop and rookie Marshon Lattimore’s interception on its final two series. Kicker Wil Lutz hit from 45 and 49 yards in the second half, hitting the longer kick inside the final two minutes. Frequent clutch performances in all phases allowed the surging Saints to once again overcome some potentially disastrous mistakes and win their fifth straight, 20-12 over the feisty Chicago Bears on Sunday. Running backs Mark Ingram and Alvin Kamara each ran for touchdowns for New Orleans (5-2). Ingram finished with 99 yards from scrimmage, including 75 on the ground, but his two late fumbles kept the Bears (3-5) in the game into the final minutes. Kamara had 76 yards from scrimmage — 48 receiving, including his 34-yard, back-shoulder catch along the sideline in the fourth quarter. The Saints were threatening to score both times the Bears stripped the ball from Ingram. Chicago converted the first fumble into its only touchdown with 3:43 left on Tarik Cohen’s short dive over a pile of players at the goal line. The second turnover occurred with a little more than two minutes left on the Bears 30, but Chicago was unable to get a first down as rookie Mitchell Trubisky’s fourth-and-1 pass fell incomplete. Bears coach John Fox said he considered running the ball, which is his team’s strength, but stopped short of expressing regret over his decision. Chicago had one more chance to tie after Lutz’s field goal with 1:35 left, but Lattimore’s interception ended that threat. “It’s hard to predict a rookie’s growth. But he has got exceptional ball skills and a lot of confidence,” Payton said of Lattimore. Trubisky completed 14 of 32 passes for 164 yards in his fourth start. Chicago’s Jordan Howard had 102 yards rushing on 23 carries. In the third quarter, Chicago had a TD overturned on video review after Zach Miller’s 25-yard catch, during which the tight end’s left leg bent unnaturally as he landed. As Miller was carted off the field with what Fox said was a dislocated knee, officials ruled that replay showed the ground caused the ball to loosen in Miller’s grasp as his upper body crashed to the turf. On the game’s opening possession, Chicago’s defense was offside on a field goal attempt, putting New Orleans’ offense back on the field. The result was Kamara’s 8-yard touchdown run. Later, Trubisky took a third-down sack by end Trey Hendrickson in Saints territory. That pushed back Connor Barth’s field goal attempt to 48 yards, and he hooked it. Brees’ longest completion was a 53-yard heave to receiver Ted Ginn between two defenders late in the fourth quarter, flipping field position before Ingram’s second fumble. Brees also connected with Michael Thomas seven times for 77 yards. Fox said Miller was taken from the game to hospital to have his knee injury treated. “He’ll be in our thoughts and prayers on our flight home,” Fox said. Injuries also struck two Bears offensive linemen. Right guard Kyle Long left the game with a hand injury in the first quarter and center Cody Whitehair left later with an elbow injury. Bears: Chicago gets its bye week before hosting Green Bay on Nov. 12. Saints: Stay in New Orleans to play their second NFC South Division opponent this season, the Tampa Bay Buccaneers.